A funny thing happened on the way to the comic store. I ran into an old friend who used to read comics. We talked for several minutes about "the Good Old Days" and, naturally, the conversation lead to comic books. I freely admit to being a "super-hero" guy. My earliest comics from childhood featured Spider-Man and Superman. And the ones I'll read as my kids are putting me in a nursing home will probably also be super-heroes. That's just me. My friend, however, was different. He grew up with tastes in other genres. He regularly visited with Jonah Hex and the Rawhide Kid when he wanted a Western fix. He ventured into foxholes with Sgt. Rock and Sgt. Fury. He thought Conan was the ultimate skull crusher and (after the first Star Wars movie was released) got heavily into science fiction. The thing is, there was something for both of us (plus all those "lame" girl romance comics and funny animal "junk".) Then one day, the comics changed. The audiences for genres besides super-heroes left. Or grew up. Or died. Whatever. And so, at the beginning of the 21st Century, we're left with a whole lot of super-hero comics and not a lot to offer someone like him. That is, until CrossGen Comics started publishing almost two years ago. The origin of this Tampa, Florida-based company is very interesting. It involves two cousins who were fans of comics deciding to re-invent the wheel. Using high production values, a bullpen-style work environment and a strict shipping schedule, CrossGen has made quite a splash. As of this writing, CrossGen has NEVER missed a single shipping date for a single comic book. And, none of their titles include super-heroes. CrossGen does Heroic Fiction. Sure, some of their characters have "powers and abilities far beyond those..." But capes and masks are nowhere to be found. Getting back to my friend, I began telling him about their sword and sorcery (my term) comics like Scion and Sojourn. CrossGen does tales of magic and gods in Mystic and The First. Sigil and Negation are their sci-fi books. Recent titles include Ruse, which is detective fiction in Victorian England, and The Path, which is set in a land like Feudal Japan. On the horizon are plans for a martial arts adventure (The Way of the Rat) and a straight horror book (Route 666). My friend truly seemed interested. I repeated the part about the reliable shipping and explained CrossGen's unique publishing formats. Their comics come out monthly ($2.95 each). They publish trade paperbacks (6 to 7 issues from one series for under $20). And, their new idea (which is borrowed from European and Japanese anthology collections) called "Compendia." These books contain more than 200 pages of comics from various titles for the amazing price of $9.95. Seven or eight comics worth of material for under ten bucks. 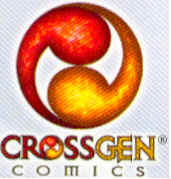 I encourage anyone reading this to check out crossgen.com for further information about the history of the "Little Comics Company that Could" along with further info about their comics, trades and anthologies. Finally, I saved Meridian for last. Meridian is a comic about a teenage girl FOR teenage girls (but guys like it, too) written by a woman. It's unfortunate that I need to single something like this out, but the truth is, most comics are created by guys FOR guys. Meridian is the comic you use to hook your girlfriend or wife. Before long, she'll be reading some of your other comics as well.